Ambitious and massive battery deployment for grid-scale storage still in planning stages. Late last year, I managed to get the first U.S. interview with Claus Rubenius about his plans for a first-of-its-kind energy storage warehouse in Mexico. Claus Rubenius is founder and inventor of Denmark's Amplex. He's also a bit of an international man of mystery, with connections to Mideast money sources and plans for an unheard amount of utility-scale energy storage. He even has a James Bond-Ian Fleming-villainesque name -- kind of like Ernst Stavro Blofeld. The firm had issued a press release claiming that it had "purchased 140 hectares of land in Baja California, Mexico" to "install 1,000 megawatts of NaS energy storage batteries." That 1,000 megawatts was to be installed over the course of seven years, according to my conversation with the CEO, in which he referred to the concept as an "energy warehouse." At the time, he suggested that the purchase of the NGK sodium sulfur (NaS) batteries would be funded with the help of Japan's Export/Import bank. That was before the tsunami and Fukushima nuclear event. NGK's NaS battery business is down significantly in 2011. Since that article was written, the trail has gone quiet and I've been contacted by a number of readers, suggesting that the plan was just more green hyperbole. So I checked in with Jacob-Rikard Nielsen of Rubenius, and he said, "We are still in the development phase, but things are progressing. We should have some interesting stuff signed in the near future." I also spoke with Daniel J. Hill, the Chairman & CEO of Silicon Border, the 4,500-acre science park where the batteries would be sited. He emphasized that there is existing grid infrastructure to support a storage facility of the size envisioned by Rubenius. He verified that Rubenius has a land purchase agreement for the 140 hectares, that this is a real project, and that they are expecting a large portion of the land purchase to close this year. In an earlier interview, Hill said that the CEO of NGK Japan had told President Calderon that NGK supported the Rubenius plan for North America. Hill said that there was an "agreement with one large utility for a portion of the first 50 megawatts." Silicon Border’s Science Park was developed for manufacturing high technology products in Mexicali, Mexico. The location was chosen by Rubenius because of its existing infrastructure and close proximity to both the Baja California power grid and the U.S. grid, including the new Sunrise Power Grid expansion. In the United Arab Emirates, the Amplex Group (a Rubenius subsidiary) has installed and commissioned the largest energy storage system in the world -- 350 megawatts, according to Mr. Rubenius. Here's a citation from NGK of shipments to that region in 2009. 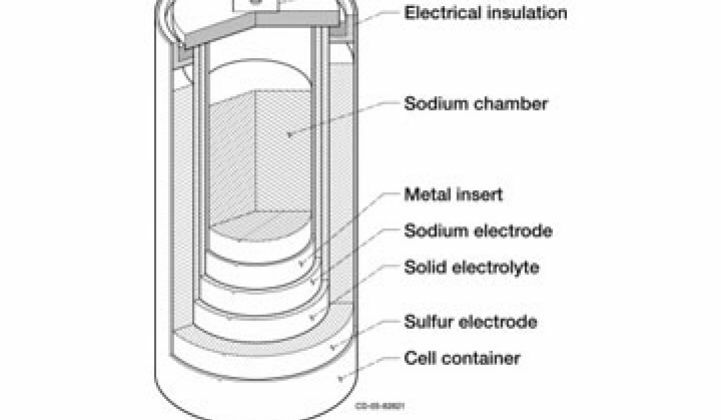 Sodium sulfur (NaS) batteries are bankable and they work, although they are not cheap. NGK is the world's only volume producer of the product (originally, the technology came from Ford of the United States). When I last spoke with Mr. Rubenius he had said that he expects to install 50 megawatts in 2011 in Baja, although that deadline looks unlikely to be met. Rubenius seems focused on massive storage capacity for price-based and diurnal energy arbitrage. "We believe centralized storage makes sense for mega-regions," according to the CEO. There are around 40 mega-regions in the world. So he's not talking about ancillary services in this instance but massive storage capacity for hundreds of megawatt-hours. This is noble, but a little misplaced. The emerging commercial energy storage applications from Independent Storage Provider entities like AES or Beacon Power are not focused on energy services, but rather on power services such as frequency regulation and moderating renewable ramp-rates. There is a market for these services and the chance for commercial viability. That's not really the case for the massive load shifting that Rubenius has in mind. Yet. Having politicians, funding, and technology supply lined up for the application is good news for Rubenius. But other legs have to be in place to make this work -- regulatory and utility stars have to be aligned, as well. And the dollars and cents have to pencil out. The regulatory and business plan piece looks as if it's still being addressed at Rubenius. But that makes sense, as we're still in the early days of energy storage markets and of Rubenius' plans. We'll continue to keep our eyes open for news on this front.